The laminate floor is an attractive and also hard wearing choice that’s both practical and also quite easy to install. So, let’s take a look at how to install a laminate floor. Wood expands and shrinks and so you should introduce it to the home before you lay the floor. Ideally leave the flooring stacked up and uncovered for 2-3 days in the room it will be laid. This allows air to circulate and for it to expand or shrink to an appropriate size. 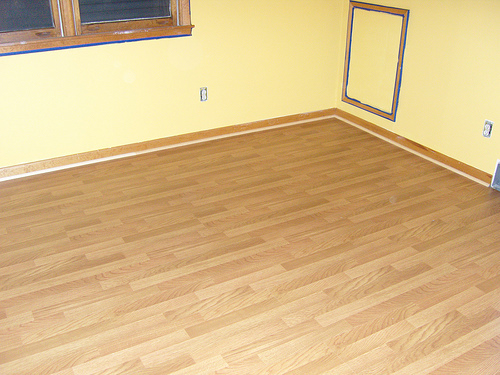 You should have around 10% more wood than the area of the floor in the room for waste reasons. The subfloor needs to be clean of dirt and debris and if a new concrete floor it will need to be cured. If there is base moulding this will need to be removed with a pry bar and hammer. The vapour barrier should be laid from the longest wall of the room across one row at a time. Depending on the manufacturer you should join the barrier through either overlapping or just butting rows beside each other – this varies so read the directions given. You will need to trim the door jambs and this can be done by laying a piece of wood against the door. Use this as a guide. You should be able to slide the new flooring beneath the area. Flat saws are idea for cutting the jambs; just ensure that they are parallel to the subfloor as this ensures that the floor and jamb look their best. Once again start with the longest wall and lay the planks with the grove facing the wall along it. Be sure to place a spacer between the plank and the wall – around 1cm is enough – place them once every foot along the all side. These allow the floor to breath and expand and ensure there is no warping of the wood. This will be covered with moulding, so there will be no problems later on. You can now install the rest of the floor by tapping the tongue into the groove row by row – ensure they fit well together. To create an attractive look you should try and stagger the joints when flooring. If the floor is laid row after row it looks unattractive. The last plank needs trimming and how much can be measured by marking it. This can be achieved by placing a plank over the last plank and then another on top of that until it sits against the spacers. Then draw a line along the plank below as this will mark the gap. You should then rip cut the plank along these lines and install them. Last but not least, you need to install the thresholds where floor ends near an open door. These come in a variety of sizes depending on the floor’s height. Finally, remove the spacers and install the base moulding in the gap. You should now have an attractive wooden floor that compliments your room. Cormac Reynolds writes for www.floorsanderhire-uk.co.uk and has a keen interest in DIY and home improvements.